Dave Damico has fond memories of talking baseball with his grandfather while growing up in Grandview, Missouri, just south of Kansas City. But one subject Damico’s grandfather rarely discussed — save for mention of fleas and lice — was his time in the trenches as a regimental-supply sergeant during World War I. 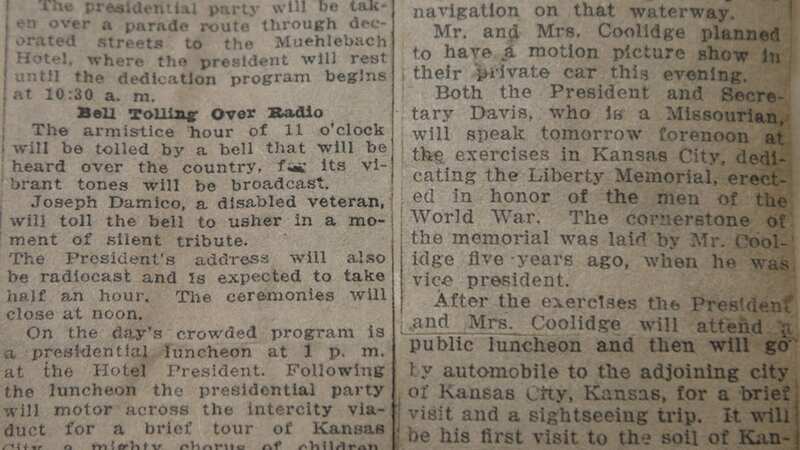 Nor does Damico remember any mention of his grandfather’s older brother, Joseph, ringing the memorial bell at the 1926 dedication of the Liberty Memorial — a celebration that included President Calvin Coolidge among a crowd of 150,000 people. 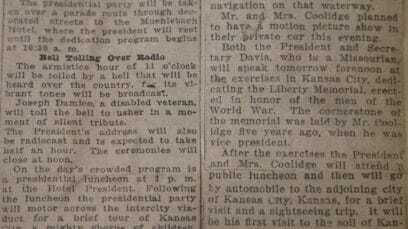 That this piece of family lore remained unknown all these years is all the more ironic, given that Damico has honored his grandfather by volunteering for a dozen years at The National WWI Museum and Memorial. At the ceremony, Damico partnered with a member of the Air Force Junior ROTC to toll the bell 21 times, a nod to the official artillery salute reserved for U.S. presidents and visiting heads of state. Damico was not sure he was related to the Joseph Damico from 1926 until he confirmed it by consulting the framed copy he has of his great grandfather’s obituary. Joseph Damico died in 1953. Military records from the Missouri secretary of state’s office say Joseph Damico was a first lieutenant who served overseas from Sept. 12, 1917 to Jan. 5, 1919. He was a member of an Army infantry regiment that was part of the 42nd Division, a unit that participated in what museum officials described as some of the most significant battles of the war. 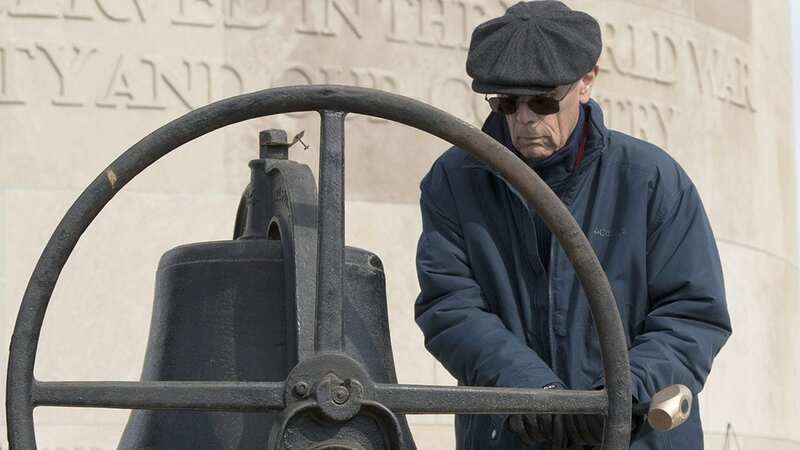 During Sunday’s ceremony, Dave Damico just wanted to ring the bell the way his great-uncle once did. “It was more afterward that I focused on walking in the footsteps of an ancestor,” he said.